Bluefish have an especially strong, fishy taste that can make them off limits to all but the most ardent fish lovers. However, you can create delicious bluefish dishes as long as you have a few good recipes and a couple of tips for toning down that fishy flavor. Dip the filets in the flour, and then salt and pepper them. Lay the filets in the frying pan, and fry them for approximately 2 minutes on each side. 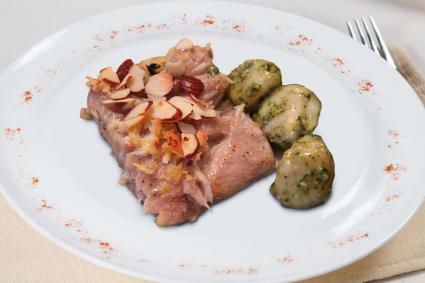 Pour in the lemon juice and almonds, and cook an additional 3 to 4 minutes, until the fish flakes when tested with a fork. Transfer the fish to a platter, and top with the butter and almonds from the pan. Combine the oil, juices, 1 tablespoon chives, salt and pepper in a bowl. Lay the filets skin-side down in a glass dish, and pour 1/2 the marinade over them. 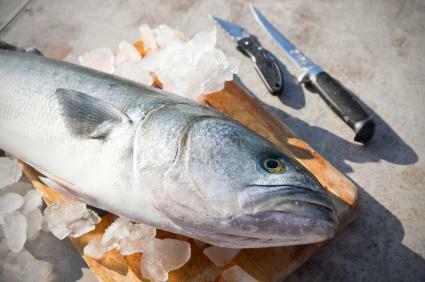 Cover with plastic wrap, refrigerate, and allow the fish to marinate for 20 minutes. Preheat the broiler, and place the filets skin-side down on a broiler pan. Broil for approximately 5 minutes until fish is done. Pour some of the unused marinade on the plate, and arrange the fish on top. Garnish with the remaining chives, and serve. Combine 1/4 cup olive oil with the salt and pepper. Toss the oil mix with the potatoes, apples, mushrooms, chives and garlic. Pour the mix into a roasting pan and bake for about 20 minutes or until the potatoes and apples are tender. While the pan is in the oven, stir the mustard and remaining olive oil together, and brush it onto the fish. When the potatoes and apples are ready, arrange the fish on top of them, and pour the wine over everything. Continue roasting about 15 minutes more until the fish is done. 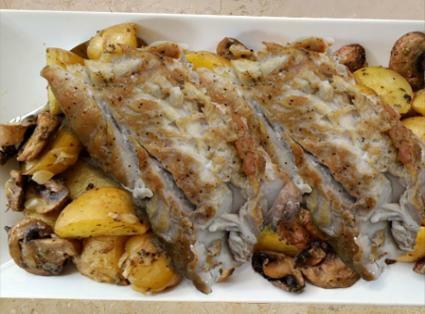 Place bluefish filets in a greased baking dish and season with salt and pepper. Combine mayonnaise, sour cream, lemon juice, and chives. Add sliced lemons and herbs after plating to garnish the dish. If the natural flavor of bluefish is a bit strong for your liking, there are a few things you can do to lighten the flavor. Fresh caught bluefish should be cleaned and gutted as soon as possible. This helps reduce that fishy taste. Bluefish has a high fat content, so try using an acidic marinade to improve the flavor. Lemon, lime, and grapefruit marinades work well. Apple cider vinegar can also help cut the fishy flavor. Brining is another option. Just make sure you pat the fish dry afterward before you begin cooking. Combine a ratio of 1 cup Kosher salt to 2 cups water in a saucepan. Add a couple of bay leaves, and bring the liquid to a simmer. Allow the pot to simmer for about 10 minutes. Add 2 quarts of ice cold water and stir. 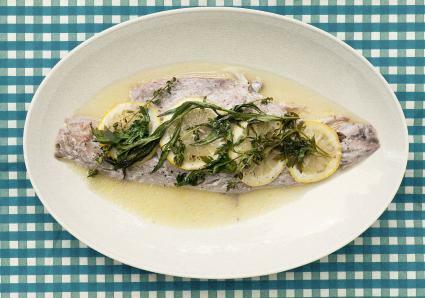 Place the bluefish in a large glass bowl, and pour the brine over it. Cover and refrigerate for about one hour before draining and cooking. Bluefish is a bit of an acquired taste, but it can be quite delicious when it's prepared well. This fish contains a lot of healthy oil which can be great brain food, so give one of these recipes a try. 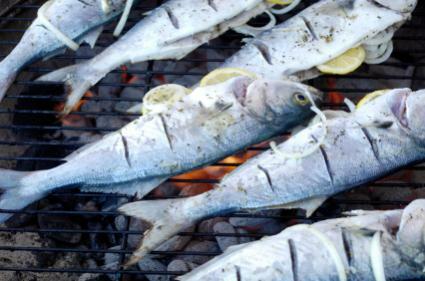 Bluefish may be making regular appearances on your own home menu.